"Goin' up" yelled Mo. "Second floor, third floor, fourth floor," shouted To. "Perfumery, stationery, wigs and haberdashery," yelled Mo. "Rooftop restaurant and restrooms," shouted Mo. The Wabbit made a wry face. His snail modifications were no longer secret and he knew very well his project was far from complete. Lapinette sighed because she knew the Wabbit always programmed jokes into a retrofit. "Wabbit!" Her voice didn't carry in the rarefied atmosphere and the Wabbit only hear "bit". So he made a guess. "Good bit of work, don't you think?" Lapinette grimaced. "Get us down Wabbit, before we freeze." "Your knees will be fine," shouted the Wabbit. "Just cling closer to Mo." "Can you hear flapping?" shouted Lapinette. The Wabbit looked pleased. "I'll leave the applause until later." "Flapping!" yelled Lapinette. This time the Wabbit turned. Talons extended, the Fake Vote hurtled from a corner of space with a banshee wail that cut through everything in its path. "It brought pals!" cried the Wabbit as he ducked. "Which floor, Sir?" asked Mo. "Basement!" yelled the Wabbit. "Goin' down!" yelled Mo. "DIY, key cutting and barbers' shop," shouted To. 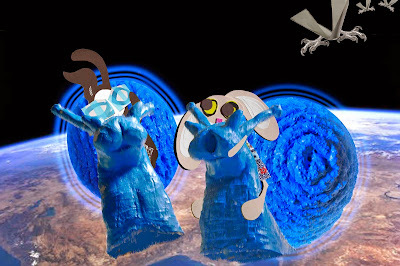 The fake votes hovered, swooped and lunged but the MoTo Snails were too fast. The Wabbit watched the curve of the earth flatten as they plummeted in free fall. "How do we stop?" shouted Lapinette. "Shop?" asked the Wabbit, "we can do that later."